The Elder Scrolls Online Morrowind takes you to Vvardenfell, the mysterious Dunkelelfen Island. There you will find 30 ancestral tombs. Here you have to collect all 30 tomb stone rubbings and brings them to the librarian in Vivec to unlock the Lost Library of Andule and Ancestral Tombs Achievement. First, you need to find and talk to the Librarian Bradyn in Vivec. He sends you to a tomb nearby. However, after that he wants you to find the other 29 ancestral tombs on the island, as well as the inscriptions. 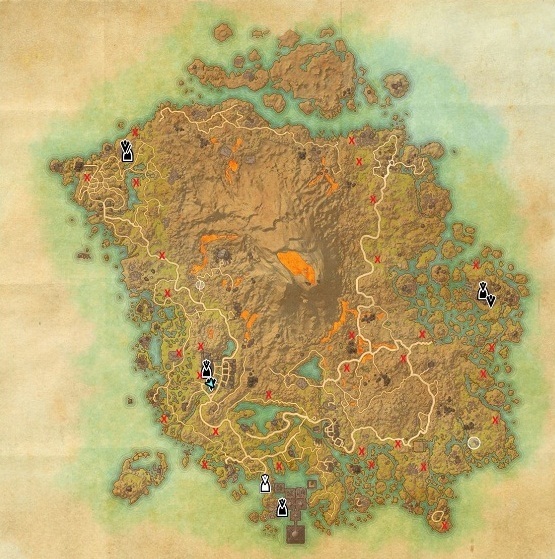 Below you will find the locations of all 30 Ancestral Tombs on a map. As soon as you have collected all 30 tomb stone rubbings and handed over to the librarian, you will receive the Achievement "The Ancestral Tombs Hunter " and the title "Librarian". Afterwards, the librarian in Vivec will give you another quest: You will find the Lost Library. You will find them north of the trail Nchuleftingth. In the library, you finally find tiles with Daedra symbols. - House Dres considers slavery to be both a sacred right and a sacred duty. - Because the house of Dres Morrowind feeds with its strength in agriculture. - Dres believes that the Dunmer will stay under their belt and focus on improving Morrowind. - We must accept and endure the hardships of life. - The way of the warrior. - Compromise, while at the same time trying to get the best out of it. - The culture of the Dunmer takes for itself, but it adapts as needed. - To be kept at all costs. - Outsiders may pay a visit to the house, but they must always be kept in mind. Once you've got all the genealogies, go back to Vivec and you'll get a beautiful miniature model of the whole island that you can pack into your homes. I found the first rubbing and turned in. Then I went around using the map to find the rest and then turned them in all at once. Didn't get the finished for the request deal. I found the list and only one was checked off and that was the first one:(!!!! !